I think we went into that house in June of 1977. My dad, Rudy Genetti, took a photo of the Genetti family crest and had a drawing made of it. Is that the only house in Castelfondo with the Genetti family crest? If not, we may have gone to a different house. I have his slides of the trip that I will be getting scanned, with a photo of the Genetti family crest and photos of the Genetti family tree that the woman who lived in the house had and let us see. By the way, my name is Cathy Genetti Reinhard. 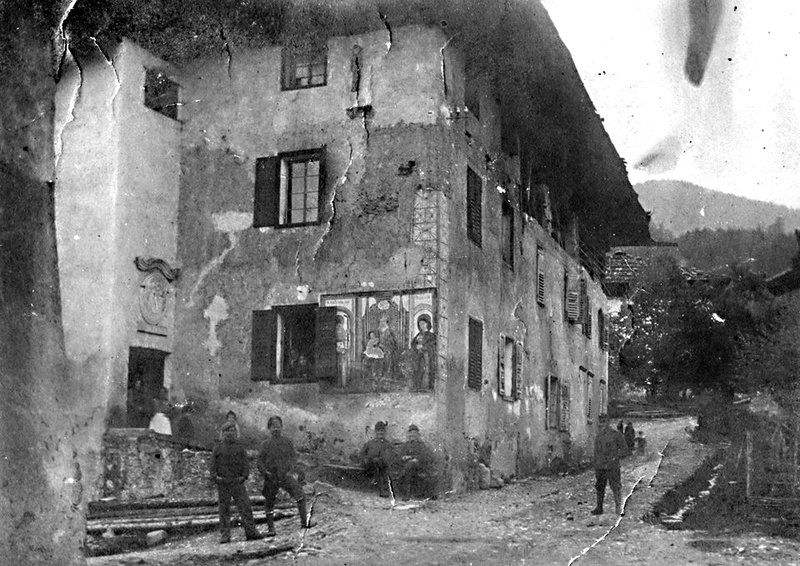 The home was owned by my great-grandfather Damiano Genetti, and by his ancestors before him. It dates to the mid-1500’s. 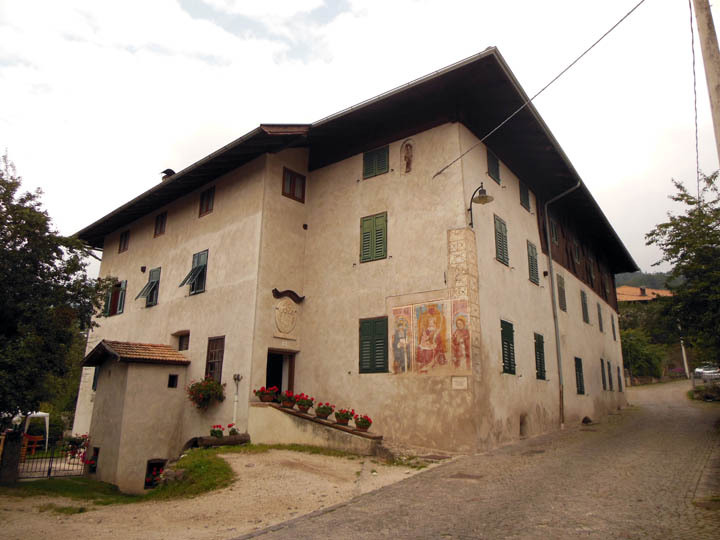 Like many of the old homes in Castelfondo, it has been renovated and now houses 5 apartments. After Damiano’s death in 1944, my grandfather (Damiano’s oldest son) and his siblings sold three of the apartments to our Italian cousins (my 3rd cousins, 1x removed – the Genetti sisters – daughters of Adriano Genetti and Tullia Piazzi). One of the sisters, Luciana Genetti, posted this photo recently on a Facebook group from Castelfondo. The Genetti Coat-of-Arms (or Stemma) has a very long history and there are five different Stemmi associated with the family. I hope to one day research and write a short book about them. The one above the doorway is not the original Stemma, but a much later interpretation. Yes, there is another house with a small carved Stemma over a doorway that is within a courtyard. This is also associated with the Genetti family but looks nothing like the beautiful marble carving on Casa Genetti Lanci. Also “Lanci” is the sopranome (or nickname) associated with my branch of the family. Alexandria shared a copy of the tree with me that Rudi photographed on his visit. I believe the fine art print of our tree (commissioned by one of the Genetti sisters) was based on this same tree. Thanks for commenting and I hope to share more of this research in the future. What an AMAZING photo!! I spent 3 summers with Luciana and the sisters. Her daughter (hi Stefi!) and the other cousins were around the same age as me and we did a mini exchange program with the family members when I was 14-17 years old. So neat to see the casa in the early 1900’s (and how little it has changed!). So many fond memories of spending time there. I wonder if anyone knows what the story of the fresco is…? Hi Jacqueline, Thanks for your comment! I have met a number of our Castelfondo cousins. How lucky you were to share experiences with them as a teenager. As for the fresco, Luciana would probably know some details about it. She contributed the funds to have it restored in 1999. As far as I know, much of the original history of the home is now lost to memory. I have been trying to piece together information that I have researched to give us a more complete understanding of the structure. It was probably built sometime around the mid-1500’s, although it could be older as several structures in Castelfondo are older than this (the original Marchetti homestead is one of the oldest). The fresco was most likely painted around the late 1500’s. From it’s flat style and lack of perspective it may have been pre-Renaissance. I suspect it could have been painted by a itinerate artist who traveled about and earned his keep by doing frescos. (There are many frescos on the exterior of buildings in nearby Fondo.) Triptych paintings with Madonna and saints such as this fresco, were common beginning in the mid-1300’s through the Renaissance. This triptych pictures Mary with child in the center sitting on a gold throne, on the left is Mary’s father St. Joachim, on the right is John the Baptist (Giovanni Battista). My guess is that the fresco may have a connection with one of the early Genetti ancestors since we had many men named Giovanni Battista on our tree. The scallop shell painted over Mary’s head is the symbol for the Virgin Mary. Since everything in this type of painting represents some kind of meaning, I’m sure it could be studied more thoroughly for a deeper interpretation. Interesting items in the fresco include: the book being held by St. Joachim, the tiny figure at the very bottom left of the fresco, and the item held in the hand of Baby Jesus. These are all clues that our ancestors left for us – but we don’t know why.